One of our favorite things to do is whip up our own bath bomb recipe. They are easy to make, good for you, and FUN! 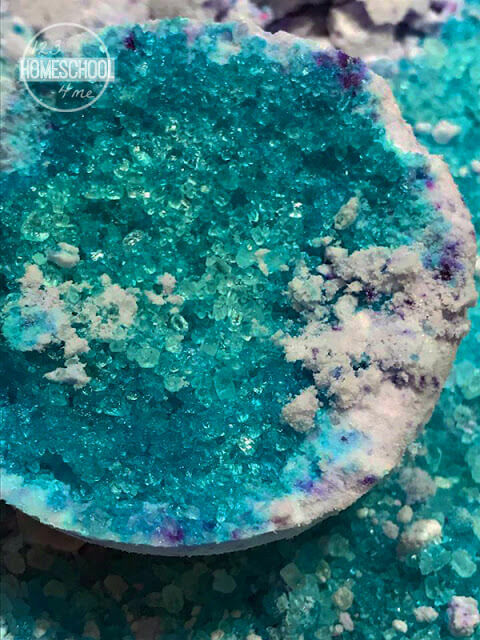 You are going to love this science inspired DIY Geode Bath Bomb Recipe. If your kids are like mine, sparkle and color is where it’s at. The more mesmerizing the better. Anything mermaid or unicorn, because it’s based off the idea of magic and fantasy. I love how excited my daughter gets over these simply magical things, it brings back so many memories of my own love for sparkle. I strive to find activities that bring the sparkle to my daughter’s eye, but also help her learn something. She is at the age where her brain craves learning and I am so glad I can provide her with what she needs and wants at the same time! These DIY Geode Bath Bombs are a simple and fun activity that integrates both STEAM and fantasy in to her life. Win Win. Bath bombs are all the rage right now, aren’t they? With shops selling baskets and bins full of colorful balls that you toss in the tub to create a sensory experience like no other, in the bathtub. They can be costly, though, so making our own is how we roll. It’s unbelievably simple, fun to experiment with what works and what creates the most reaction, as well as being able to customize them to fit our needs. These bath bombs can be purely for fun but you can also add essential oils for both therapeutic reasons but also for extra sensory experience. I like to use lavender for my daughter because it helps her sleep and also helps her skin that is plagued with eczema. If you don’t have essential oils or have no desire to use them, that will not affect this activity negatively at all. The first step is to add about 2 cups of baking soda to the mixing bowl. Add in about ½ cup of epsom salt, 3 TBSP of cornstarch, and a few drops of food coloring. If you are adding essential oils, add drops now. I added about 10 drops of lavender. Using a fork, mix the ingredients together until the food coloring is spread around. 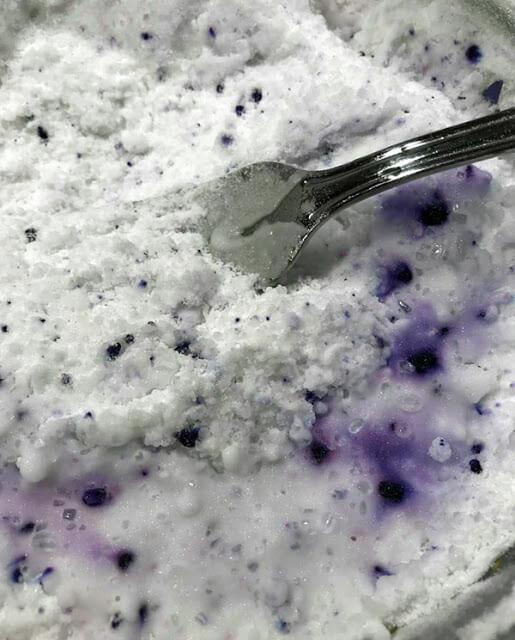 The food coloring might still be in clumps, but it will spread itself out with the next step. Using a spray bottle, spray water onto the dry mixture. It is crucial that you do not get the mixture to saturated. You want just enough water to make the dry ingredients stick together. If you add too much water it will lessen the reaction when the bombs are added to the bath. I start with 5 sprays, mix it completely with the fork, and add more sprays if necessary. The mixture should clump in your hand but not be runny. Split the fillable ornaments in half and fill each half about ¾ way full of the bath bomb mixture. Press it into the molds until it is pressed down completely. You want to create a crater type divot in the middle of the mold. This creates the look of the geode after the next few steps are added. Put the bath bombs in molds aside for now. In separate bowls, add about ½ cup of epsom salt to each. I did this in containers that have lids like tupperware. I added food coloring to each bowl as well. I used the same color but varying amounts to each. For example, in the first bowl I added 4 drops of color. The next container I added three and the last I only added 1 drop of color. Put the lids on and shake. Shake until the color is completely dispersed. 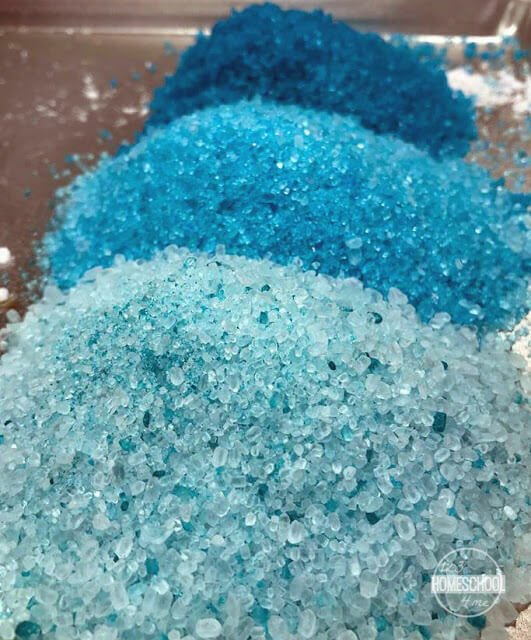 Add a spoonful of the darkest color on top of the bath bombs. I spread that color out completely covering the surface of the bath bomb. Next I sprayed one spray of water to help the epsom salt set into the bath bombs. You can also press down on the epsom salt. Next I added a little of the lighter color, sprayed, and pressed. I repeated this process for the lighter color as well. Each color added I left a ring of the darker around the outside. Set the bath bombs aside to dry for at least 5-6 hours. I prefer to let them set for 24 hours but my daughter was granted my sense of patience, so we usually use them after 5 or 6 hours. They may still be a little crumbly after the shorter drying time, but the concept can still be seen. The reaction in the bathtub will still happen. This is the perfect activity to combine with teaching about rocks, volcanos or mysteries of the world. Geodes are hollow rocks that have crystals inside. They don’t just grow this way, there are a few different odd things that must happen before these crystals can be created. It is fun to recreate our own mystery of the world in a way that children can understand and work first hand in creating their own.